Rill formation is the predominant erosion process in slope land in the Loess Plateau, China. This study was conducted to investigate rill erosion characteristics and their effects on runoff and sediment yielding processes under different slope gradients at a rate of 10°, 15°, 20° and 25° with rainfall intensity of 1.5 mm min−1 in a laboratory setting. Results revealed that mean rill depth and rill density has a positive interrelation to the slope gradient. To the contrary, width-depth ratio and distance of the longest rill to the top of the slope negatively related to slope gradient. All these suggested that increasing slope steepness could enhance rill headward erosion, vertical erosion and the fragmentation of the slope surface. Furthermore, total erosion tended to approach a stable maximum value with increasing slope, which implied that there is probably a threshold slope gradient where soil erosion begins to weaken. 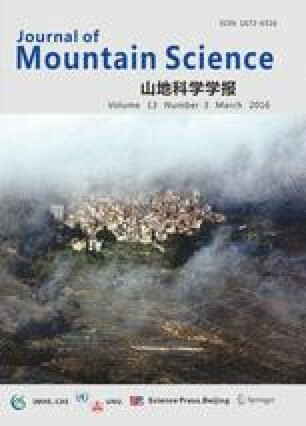 At the same time, the correlation analysis showed that there was a close connection between slope gradient and the various indices of soil erosion: the correlation coefficients of slope gradient with maximal rill depth, number of rills and the distance of the longest rill from the top of the slope were 0.98, 0.97 and −0.98, respectively, indicating that slope gradient is the major factor of affecting the development of rills. Furthermore, runoff was not sensitive to slope gradient and rill formation in this study. Sediment concentration, however, is positively related to slope gradient and rill formation, the sediment concentrations increased rapidly after rill initiation, especially. These results may be essential for soil loss prediction.